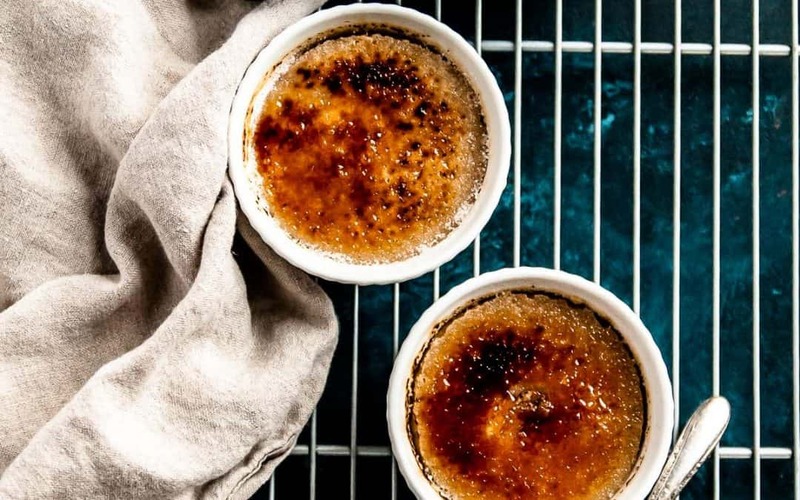 Your favorite vegan creme brulee, with a gingerbread twist! 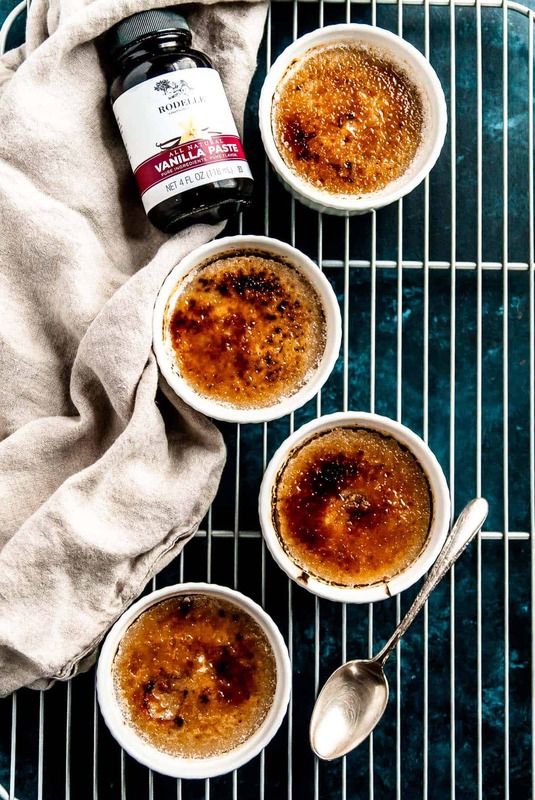 This vanilla gingerbread vegan creme brulee is a perfect addition to your holiday dessert table. This post is sponsored by Rodelle Vanilla. Thank you for supporting the brands that make this space possible! A chocolate spiced version of the ultimate holiday cookie, vegan gingerbread gets a dark chocolate twist! 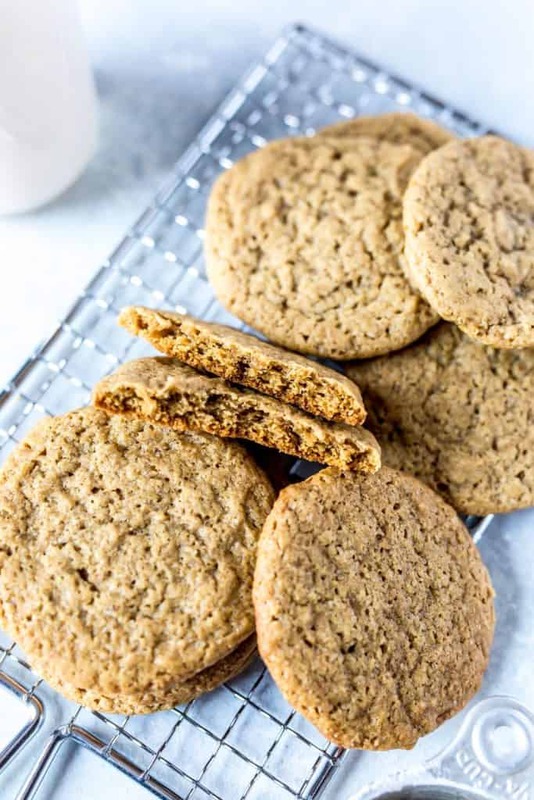 Ready in under 30 minutes, these vegan gingerbread cookies are crisp on the outside and chewy on the inside. 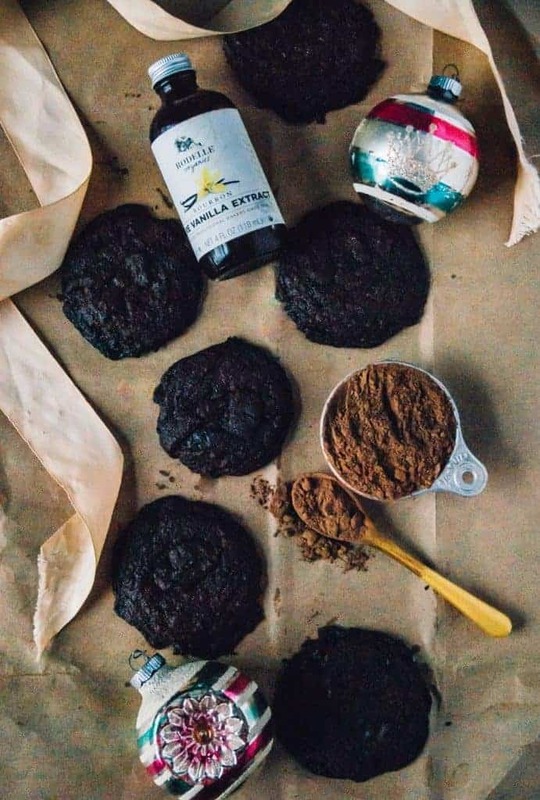 The ultimate vegan cookie recipe! Back in grade school I loved super dorky things like my American Girl dolls (who thought they were the coolest girl because of these? ), every single horse thing I could find, and of course, Colonial Williamsburg. Oh, you haven’t gone to a place that acts like you are living in the 1800’s? Let me tell you, I thought it was freaking awesome when we went to visit Williamsburg in Virginia. They played that awesome hoop game! Everyone lives in cool old houses! Besides the fact that I got to pretend that I was Felicity from American Girls, I also found out that this magical place also knew how to do tasty baked goods. In the main part of ‘town’ there was a place called the Raleigh Bake Shop and they sold the absolute best baked goods, from pies to cookies, they had it all. My family’s favorite always seemed to be the ginger cakes, which were basically gingerbread cookies, but thicker and puffier and coated with a dusting of flour, from rolling out and cutting. Luckily for me, they also sold a small cookbook that detailed the treats they made in the bakery so I could make them any time I wanted at home. I haven’t made many other recipes from the book since, but the ginger cakes seem to always find their way into our family’s cookie arsenal year after year. One year, I even went as so far to close off the kitchen from my dad (who loves these cookies) while I made a giant batch of these cookies for him as a Christmas gift. I kept yelling at at my dad ‘You can’t come in here! !’ and trying to keep the cookies under wraps by shutting all the doors and insisting he was banished to the other half of the house for the afternoon, even though I knew he knew what I was doing. Even from an early age, I started showing my love with cookies! I’m all in and full force into the holiday baking season. Right now, we have no less than three types of cookies in the house and maybe even a pie or bar or two. I don’t think you are hearing complaints from anyone in our house right now. 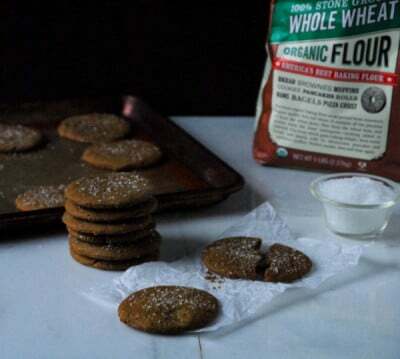 I’ve used Bob’s Red Mill Organic Whole Wheat flour for these sturdy cookies and the Sparkling Sugar is just perfect to sprinkle on a batch of these vegan gingerbread cookies. These did turn out a bit thinner than I had hoped, but they are still a perfect cross between some of the teeth breaking hard gingerbread cookies out there and the super puffy pillows of ginger cakes that I remember. One of the biggest struggles in vegan baking for me has been making a crispy cookie, especially sans oil or butter. 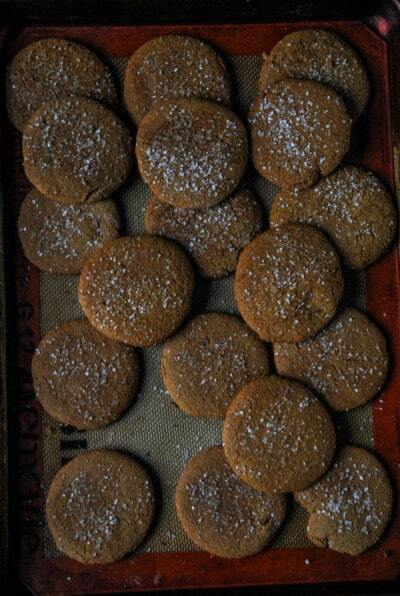 In the end, I figured out that a couple tablespoons of coconut oil does the trick for these vegan gingerbread cookies, while not going too overboard with the fat content. 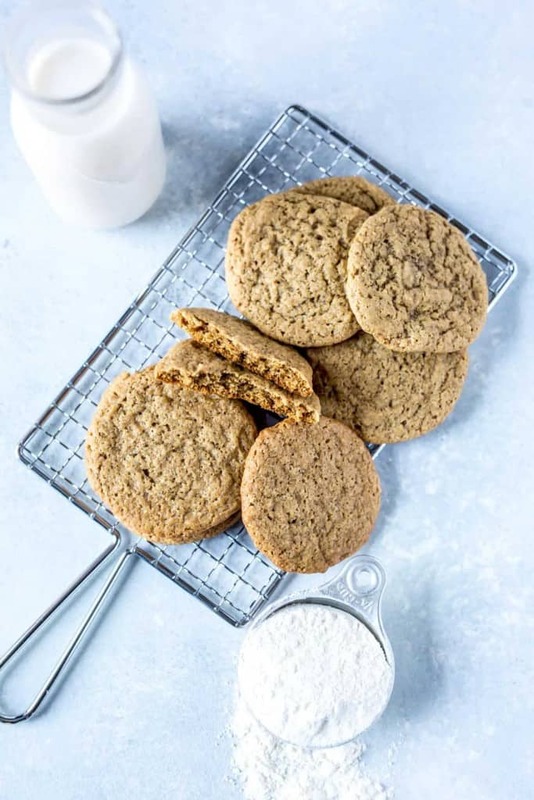 You can go without the sparkling sugar garnish on these cookies, but I think they add a little more sweetness and kind of look like they are dusted with shimmering snow, so why wouldn’t you want that? These also keep well for a few days, so if you need to bake cookies ahead of time that will hold up, these will do the trick. 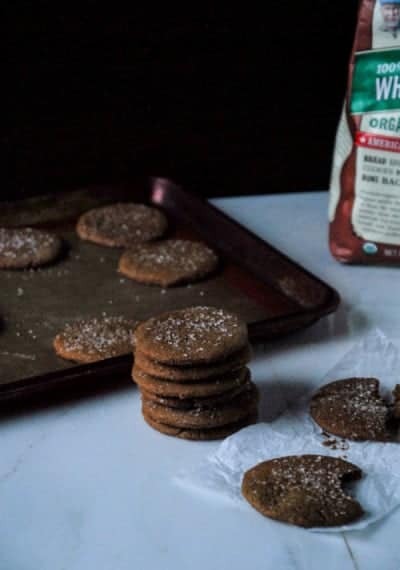 These vegan gingerbread cookies are arguably the easiest crispy gingerbread recipe on the internet. (Bold claim, I know). Literally all you have to do is add all the ingredients into a bowl and mix until combined. Then, you’ll have to use your hands and knead the dough for a few minutes until it’s nice and smooth. The gingerbread cookie dough will be extremely firm, but that’s what you want! Once you’ve made the dough, you’ll need to roll it out and use cookie cutters to form your desired shapes. I used a round biscuit cutter to make my life easier, but you could totally use the traditional gingerbread cookie cutter or something more creative. 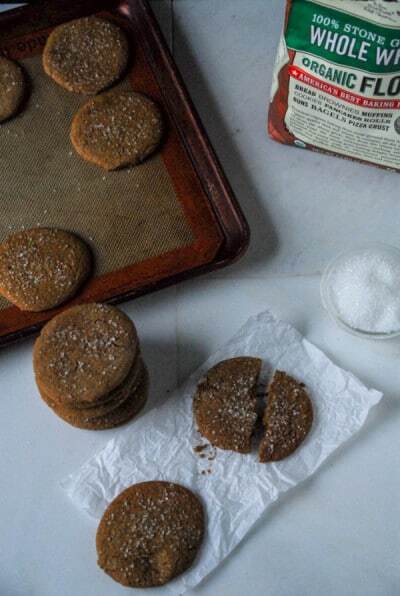 You’ll only need to bake these crispy gingerbread cookies for 10-12 minutes. When in doubt, pull them out of the oven at the 10 minute mark to be safe. You can’t really tell when these vegan gingerbread cookies have turned golden brown, and as much as I love them crispy on the outside it’s better to have them be slightly under baked than over baked! Preheat oven to 375ºF. Line 2 cookie sheets with parchment paper and set aside. In a large bowl, whisk together all the ingredients except for the whole wheat flour. Once mixture is thoroughly mixed, add in the whole wheat flour and mix until dough is stiff and comes together. Knead dough for an additional 2 minutes to create a smoother texture. Dust a work surface with flour and roll out cookie dough to 1/4 inch thick. Cut into desired shapes (I used a biscuit cutter to cut into circular shapes). Bake for 10-12 minutes or until crispy and golden brown. 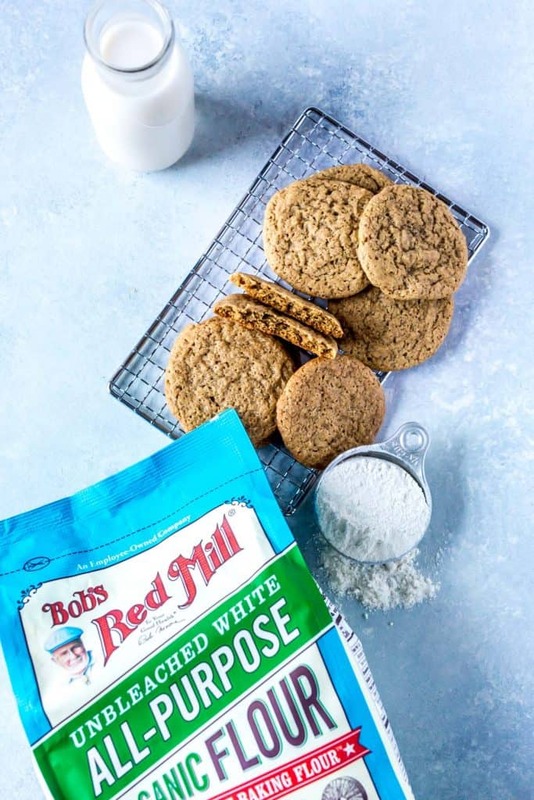 Thanks to Bob’s Red Mill for sponsoring this post. I received product and was compensated for my time, but all opinions are my own. 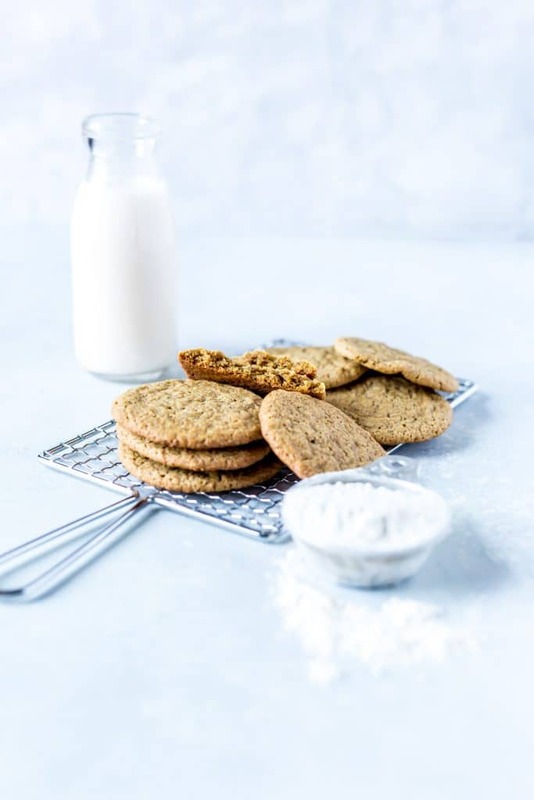 Perfectly soft vegan ginger cookies that are perfect for frosting, or by themselves! So easy to make and great for the holiday season. This post is sponsored by Bob’s Red Mill. Thank you for supporting the brands who make this space possible! Well here we are, made it to the other side of Christmas! 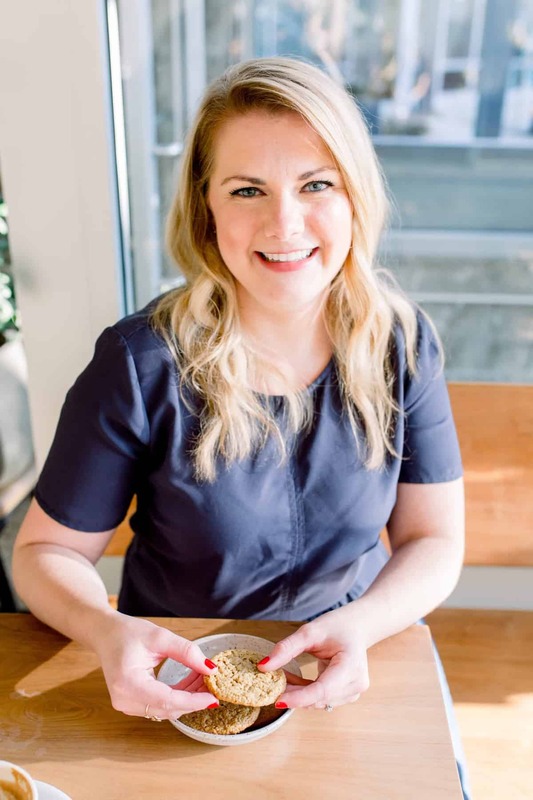 Whether your style is a large family gathering, small to-do, or anything else in-between, I think it’s true that we all love one thing about this time of year…the FOOD. I really love that there are things specifically reserved for this time of year, like my grandma’s cheeseball recipe, making cutout sugar cookies with my dad, and doing our yearly lasagna for dinner tradition (which is more common than I thought it was!). One thing that I’ve never gotten into, but kind of wish I had the patience for, is making gingerbread houses! I mean, A Cozy Kitchen made a KILLER one and I’m thinking uhhh, I don’t even have the patience to properly frost a cake more than once a year! 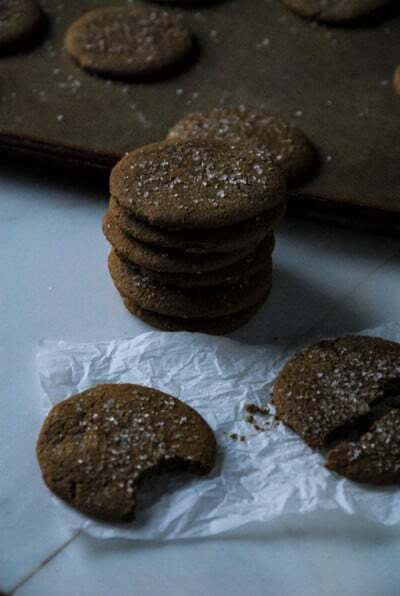 But, I do have the patience for vegan ginger cookies that are soft, easy, and SO so perfect for cutting out into little gingerbread men or slathering with vegan frosting. I’m actually not one to spring for the gingerbread, especially since they’re usually rock hard, don’t taste great, and lack a little extra oomph to them. BUT, this version fixes all of those problems. Perfect, easy, and full of oomph! One of the BEST things about this recipe is that it doesn’t require fresh ginger! I almost never have it on hand, so I wanted something that would come together with ingredients I always have on hand, but still pack that ginger-y punch. Make sure to whisk your dry ingredients! 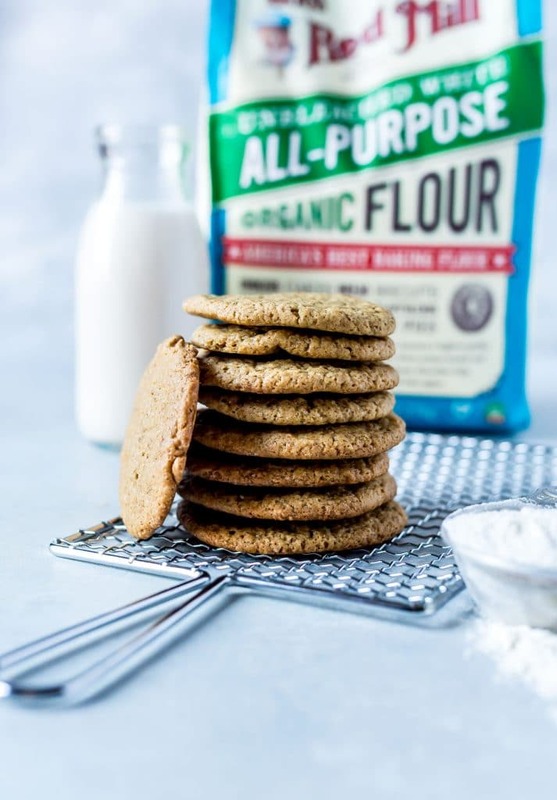 This is going to prevent that clumping situation that is NO fun when you get a mouthful of baking soda or too much ginger in one cookie and not enough in another. You know what I’m talking about and it’s NOT fun. Use good flour! I know this seems kind of like a given, but using good flour is going to give you a more consistent, even result. I also think that when a cookie doesn’t have a ton going on in it, each ingredient is super important. 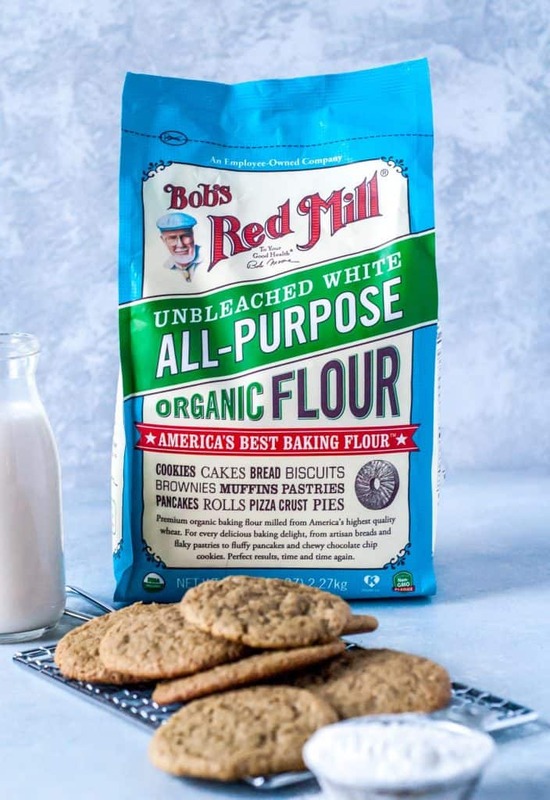 My favorite is Bob’s Red Mill Organic Unbleached All-Purpose Flour for ALL my baking. Hands down, the best! Watch your bake time! The dough for these vegan ginger cookies is already on the brown side, so they aren’t going to brown up like other cookie doughs. Pull these out before you think they’re totally done, or else you’re going to end up with overdone cookies! And that’s it! 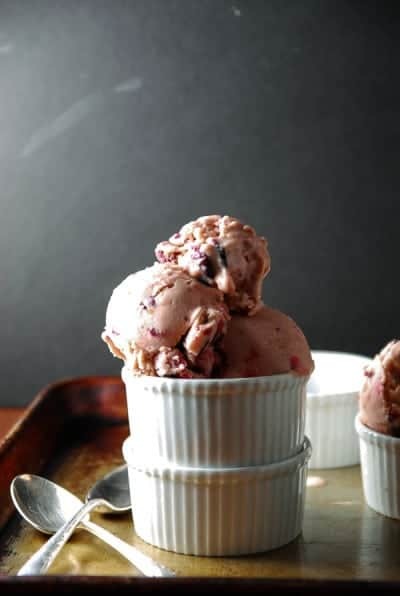 These are actually pretty easy and don’t require anything special to make them, so you could whip them up in time for a party or celebration and let them cool for a bit before packing up and serving. I’ve also topped these with both vanilla or chocolate frosting and they are equally as delicious. Preheat oven to 350 degrees F. Line 2 rimmed baking sheets or cookie sheets with parchment paper and set aside. In a large bowl, whisk together the flour, baking soda, salt, cinnamon, ginger, and nutmeg. Add the olive oil, maple syrup, brown sugar, ground flax seed, and water. Mix together until no flour streaks remain. Scoop out dough by the tablespoon, placing onto the prepared baking sheets. Space the cookies apart evenly, placing a max of 12 cookies onto each baking sheet. Bake for 11-13 minutes, until edges look crispy and tops feel firm when touched. Allow to cool slightly before serving. These cookies can be stored and kept in a sealed container for up to a week.